Successfully Added Unlocked Tri-Band Dual Screen + Dual Keyboard Cell Phone to your Shopping Cart. Three GSM band (900MHz, 1800MHz, 1900MHz) unlocked Dual SIM cellphone with two LCD displays with two full sized keyboards for easy and convenient usage anytime. Here is one of the most unique mobile phones you will ever find. This phone has two functioning keypads, two screens, and allows you to make and receive calls with either keypad. You can use the outer keypad + display when you want to make and receive simple phone calls, and then flip open to the larger touch screen display when you need to more easily access the phones more advanced features or use it as a digital media device. Sounds great, doesn't it? Well, it gets even better than that - this phone has all the multimedia features you would expect in a high price name brand phone, but this one comes to you at a direct wholesale price! Those multimedia features include FM radio, Bluetooth with A2DP + AVRCP + FTP, WAP internet browser, two digital photo and video cameras, MP3 audio player, MP4 video player, software productivity tools, picture viewer, and more. This baby has endless possibilities for productivity and fun, and since it can operate with two SIM cards (with dual-standby) + three GSM bands, you can be using it on your business or pleasure travels through most of this wonderful world. Available while supplies last at a low wholesale price with no M.O.Q. (no minimum order quantity). Great three GSM band cell phone and digital life device. 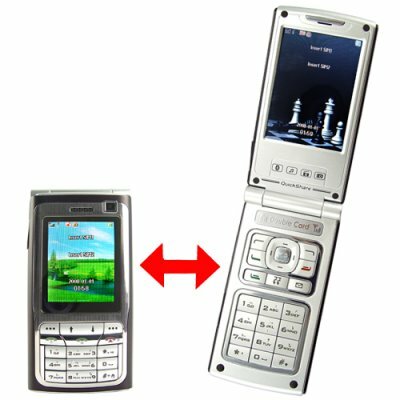 Unlocked cellphone with Dual SIM + Dual standby. Additional functions: Digital life device - MP3/MP4 players, FM radio, E-Book and text reader, PDA productivity type software tools, etc.